ARLINGTON, Va. – Pope Francis today appointed Bishop Michael F. Burbidge, 59, to serve as the fourth Bishop of Arlington. Until today, he was serving as Bishop of the Diocese of Raleigh. He succeeds Bishop Paul S. Loverde, 76, who has led the Diocese since 1999. Just one day after his appointment, Bishop Michael F. Burbidge will celebrate Mass on Wednesday, October 5, at 12:05pm at the Cathedral of Saint Thomas More– everyone is invited to attend. Today Bishop Burbidge along with his predecessor, Bishop Paul Loverde, addressed the media at a 10:00am news conference in Burke Hall at the Cathedral of Saint Thomas More in Arlington. “Like all of you, I have profound respect and admiration for Bishop Loverde. He is a treasured friend and be assured that you will always see the unity that is ours as brothers. … And to Pope Francis, I express my deep gratitude for appointing me the Fourth Bishop of Arlington and convey to him my deep loyalty and faithful obedience,” Bishop Burbidge said. “I am confident that you will find Bishop Burbidge to be personable and welcoming, perceptive and attentive, with much wisdom from an experienced background… A man of integrity, he teaches the truths of our faith with clarity and joy. He possesses the heart of a shepherd, reflecting the pastoral love and care flowing from the Heart of Christ,” Bishop Loverde said. 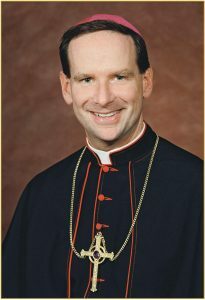 Bishop Burbidge was born June 16, 1957, in Philadelphia, Pennsylvania, the second son of Francis and Shirley Burbidge. He attended Catholic grade schools and graduated from Cardinal O’Hara High School, Springfield, PA, in 1975. After graduation from high school, he went to St. Charles Borromeo Seminary and was ordained a priest of the Archdiocese of Philadelphia by John Cardinal Krol in 1984. Then-Father Michael Burbidge’s first priestly assignment was as Parochial Vicar of St. Bernard Church in Philadelphia, where he served for two years. From 1986-1992 he was on the faculties, successively, of Cardinal O’Hara High School, Archbishop Wood High School and St. Charles Borromeo Seminary, where he also served as Dean of Students. On September 5, 2002, then-Monsignor Burbidge was ordained Auxiliary Bishop of Philadelphia. He chose as his episcopal motto the words “walk humbly with God”, from the prophet Micah (6:8): “You have been told … what the Lord requires of you: Only to do the right and to love goodness, and to walk humbly with your God.” Bishop Burbidge’s coat of arms includes visual elements which reflect his devotion to the Blessed Virgin Mary, St. Charles Borromeo, Saint Michael (his baptismal patron), as well as the bishop’s Irish ancestry. 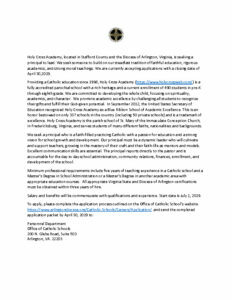 Bishop Burbidge’s service to the Catholic Church nationwide and globally reflects his long-standing experience in promoting Catholic education, vocations, catechesis, among many other areas of Church life. On June 8, 2006, Pope Benedict XVI named Bishop Burbidge the fifth Bishop of the Diocese of Raleigh; he was installed in Raleigh on Aug. 4. As bishop, he has led the Diocese during a period of rapid growth; in the past decade, the number of registered Catholics has increased over 40 percent to an estimated population of 430,000 Catholics. Bishop Burbidge’s pastoral priorities in Raleigh have included the following: promotion of the life and dignity of the human person; faith formation and sacramental practice; the promotion of cultural diversity; promotion of vocations to the priesthood and consecrated life; implementation of the national pastoral initiative on marriage; effective stewardship of resources; planning for the effective management of growth; and construction of a new cathedral, the dedication of which is planned for July, 2017.